Memory B cells are a central component of humoral immunity, and yet little is known about their longevity in humans. Immune memory after smallpox vaccination (DryVax) is a valuable benchmark for understanding the longevity of B cell memory in the absence of re-exposure to Ag. In this study, we demonstrate that smallpox vaccine-specific memory B cells last for >50 years in immunized individuals. 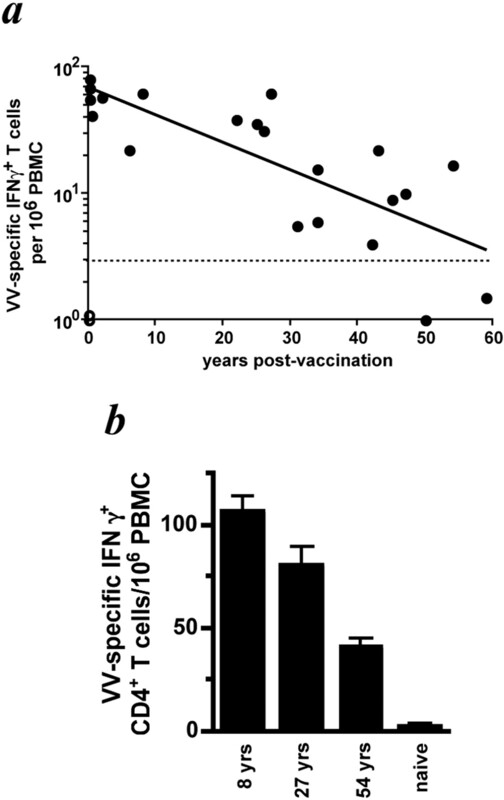 Virus-specific memory B cells initially declined postimmunization, but then reached a plateau ∼10-fold lower than peak and were stably maintained for >50 years after vaccination at a frequency of ∼0.1% of total circulating IgG+ B cells. These persisting memory B cells were functional and able to mount a robust anamnestic Ab response upon revaccination. Additionally, virus-specific CD4+ T cells were detected decades after vaccination. These data show that immunological memory to DryVax vaccine is long-lived and may contribute to protection against smallpox. Long-lived plasma cells and memory B cells are responsible for the long-term humoral immunity elicited by most vaccines (1). Abs are the body’s first line of defense against infection, and circulating Abs are the primary indicator of immunity for most human vaccines (2). Long-lived plasma cells are responsible for the continuous maintenance of serum Ab levels (3, 4, 5). Memory B cells are responsible for driving the rapid anamnestic Ab response that occurs after re-exposure to Ag, which is important for eliminating the pathogen and toxic Ags not cleared by pre-existing circulating Abs. Memory B cells may also play a role in replenishing the pool of long-lived plasma cells to maintain long-term Ab levels in the absence of pathogen (5, 6). The dynamics of Ag-specific memory B cells in humans in the absence of re-exposure to Ag is not well understood. Mechanistic studies of immune memory have been done in mice showing that B cell memory can be stably maintained in the absence of Ag (7), but in humans this remains an open issue. Resolving this issue is important for understanding the maintenance of immune memory in humans and for future vaccine design. Immune memory after smallpox vaccination (DryVax) is a valuable benchmark for understanding the kinetics and longevity of B cell memory in the absence of re-exposure to Ag, since immunization of the U.S. population was stopped in 1972 and smallpox disease was declared eradicated worldwide in 1980 (8). In addition, there is currently great public health interest in smallpox immunity due to the possible threat of bioterrorism (9). Study subjects were all normal healthy volunteers. The date postvaccination used in the data analysis is the date of the most recent smallpox vaccination that an individual reported. Nine of 27 of the individuals vaccinated >1 year ago received multiple vaccinations. Seven of those individuals were vaccinated twice (once as a child and once as an adolescent, teenager, or adult), one individual was vaccinated three times, and one individual was vaccinated four times over a 25-year period. In the instances of multiple smallpox vaccinations, the year of the most recent vaccination was used to establish the years postvaccination of the vaccinee in all data analysis. Gender distribution was ∼50:50. Of the eight individuals from whom acute PBMC samples were obtained, three received their first vaccination and five received their second vaccination. Serum samples were obtained from some individuals for whom cell samples were not available. PBMC were isolated from fresh blood using Vacutainer cell preparation tubes (BD Biosciences, Mountain View, CA). PBMC were resuspended in R-10: RPMI 1640 plus 10% FCS supplemented with penicillin, streptomycin, l-glutamine, and freshly added 50 μM 2-ME. Fresh cells were used in all assays. Serum was isolated using serum separation tubes and then heat inactivated at 56°C for 30 min. Purified vaccinia immune globulin (VIG) 5 was supplied by Cangene (Winnipeg, Manitoba, Canada). Vaccinia virus (VV)WR was used for all experiments except plaque reduction neutralization test (PRNT) determinations. VVWR stocks were grown on HeLa cells, infecting at a multiplicity of infection (MOI) of 0.5 (10). Cells were harvested at 60 h, and virus was isolated by rapid freeze-thawing the cell pellet three times in a volume of 2.3 ml of RPMI plus 1% FCS. Cell debris was removed by centrifugation. Clarified supernatant was frozen at −80 °C as virus stock. VVWR stocks were titered on Vero cells (∼2 × 108 PFU/ml). VV Ag preparation for Ab ELISA and B cell ELISPOT use was done by UV-inactivating stock VVWR with trioxsalen/psoralen (4′-aminomethyl-trioxsalen HCl; Calbiochem, La Jolla, CA) (11). Briefly, 1 × 108 PFU/ml VVWR in 0.1% BSA and 10 μg/ml trioxsalen were incubated for 10 min at room temperature and then UV inactivated with 2.25 J/cm2 (10 min in a Fisher UV Crosslinker UVXL-1000; Fisher, Pittsburgh, PA). This resulted in a >108-fold reduction in PFU. UV-inactivated virus was then used at a 1/5 (ELISPOT) or 1/25 (ELISA) dilution in PBS with BSA supplemented to a final concentration of 0.1%. VVNYCBH stocks were generated as low passage stocks from commercial Dryvax. Using a variation of our mouse memory B cell assay (3, 5), we have established a human memory B cell assay, with details to be published elsewhere (S. Crotty, R. Aubert, J. Glidewell, and R. Ahmed, manuscript in preparation). PBMC were plated in 24-well dishes at 5 × 105 cells/well in R-10 supplemented with a mix of polyclonal mitogens: 1/100,000 pokeweed mitogen extract (made at Emory University), 6 μg/ml phosphothioated CpG ODN-2006 (12), and 1/10,000 Staphylococcus aureus Cowan (Sigma-Aldrich, St. Louis, MO). Twelve to 24 wells were cultured per individual. Cells were cultured for 6 days at 37 °C in 6–8% CO2. In preparation for the ELISPOT, 96-well filter plates (MAHA N4510; Millipore, Bedford, MA) were coated overnight with VV Ag (see above) diluted 1/5 in PBS. Uninfected HeLa cell lysates prepared in an identical manner were used as a negative control Ag. To detect all IgG-secreting cells, a separate plate was coated with 10 μg/ml goat anti-human Ig (Caltag Laboratories, Burlingame, CA). Plates were washed and blocked with RPMI 1640 plus 1% BSA (fraction V; Sigma-Aldrich) for 2–4 h at 37°C before use. Cultured PBMC were washed thoroughly, plated onto ELISPOT plates, and incubated for 5–6 h at 37°C. Detection reagents were 1 μg/ml mouse anti-human pan IgG Fc biotin-conjugated Ab (Hybridoma Reagent Laboratory HP6043B) in PBS plus 0.05%Tween 20 plus 1% FCS, followed by 5 μg/ml HRP-conjugated avidin D (Vector Laboratories, Burlingame, CA), and developed using 3-amino-9-ethylcarbozole; Sigma-Aldrich). Developed plates were counted using a dissecting microscope. Data are represented as the frequency of VV-specific B cells as a percentage of the total IgG+ memory B cells in PBMC from a vaccinee. Direct ELISA was done using Linbro/Titertek flat-bottom 96-well plates (ICN Pharmaceuticals, Costa Mesa, CA) coated overnight with 100 μl/well VV Ag (see above) at 1/25 dilution. Mouse (0.25 μg/ml) anti-human pan IgG Fc biotin-conjugated Ab (Hybridoma Reagent Laboratory HP6043B) in PBS plus 0.2% Tween 20 plus 1% FCS, followed by 1.0 μg/ml HRP-conjugated avidin D, was used for detection and developed using o-phenylenediamine. Anti-VV serum IgG Ab titer was determined as end point titer 0.1 OD > background (no serum well). Fifty percent plaque reduction (PRNT50) was determined by standard techniques (13), incubating serum dilutions with 40–100 PFU VVNYCBH. In addition, adherent HeLa cells instead of Vero cells were used as the target cell monolayer in some duplicate assays with moderately more sensitive results. For immunoblots, purified VV Copenhagen strain (9 × 107 PFU/ml) was diluted 1/1 in SDS-PAGE sample buffer and 100 μl was resolved on 4–15% 2-D/Prep gradient gels (Bio-Rad, Hercules, CA). VV genes were amplified from VV genomic DNA by PCR and cloned into bacterial expression vectors using the UCI PCR Express recombination cloning platform (P. Felgner, unpublished data), incorporating an N-terminal poly-histidine tag. Recombinant proteins were expressed in vitro using RTS 100 Escherichia coli HY kits (Roche, Basel, Switzerland) and the reactions were dissolved in one-half volume of SDS-PAGE sample buffer. After SDS-PAGE all proteins were transferred to nitrocellulose. Monoclonal anti-polyhistidine Ab (Sigma-Aldrich) followed by goat anti-mouse IgG (H + L) alkaline phosphatase-conjugated secondary Ab (Bio-Rad) was used for detection of recombinant protein. Routinely, human sera were diluted to 1/50 whereas VIG were used at 1/500, and an alkaline phosphatase-conjugated Affinipure goat anti-human IgG+IgM+IgA (H + L; Jackson ImmunoResearch Laboratories, West Grove, PA) was used as the secondary Ab. PBMC were infected with live VVWR at a MOI of 1 (MOI = 1) for 60–75 min at 37°C before being added to the IFN-γ ELISPOT plate at 3 × 105 cells/well (similar results were observed at a MOI = 3 or 0.3) and then incubated at 37°C and 6–8% CO2 for 20 h, similar to the ELISPOT designed by Ennis and colleagues (13). A minimum of six wells of VV-infected PBMC were assayed per individual. Uninfected cells were assayed as a negative control. Staphylococcal enterotoxin B (0.5 μg/ml)-stimulated cells were used as a positive control. Background spots in uninfected wells were detected at a frequency of <3 per 106 (range, 0–10). To detect CD4+ T cell responses, PBMC were first depleted of CD8+ cells with paramagnetic bead separation (>94% depletion) (Miltenyi Biotec, Auburn, CA). Tests were performed using Prism 4.0 (GraphPad, San Diego, CA). Memory B cell data (see Fig. 1⇓b) was curve fit using a one-phase exponential decay with plateau. Time-binned groups (see Fig. 1⇓c) were tested using one-way ANOVA with Bonferroni’s multiple comparison test (95% confidence interval). Other statistics were done using a two-tailed, unpaired t test with 95% confidence bounds. Longevity of smallpox vaccine-specific B cell memory. a, Memory B cells were measured by an ELISPOT-based technique using PBMC first cultured for 6 days in the presence of mitogens to induce differentiation of memory B cells into ASC. Each spot represents an Ag-specific ASC. Individuals were tested for VV-specific memory B cells using VV-infected cell lysate as the ELISPOT coating Ag. HeLa cell lysate was used as a control Ag. One vaccinated (54 years postvaccination) and one nonvaccinated (naive) individual are shown. One of many replicate wells is shown for each. b, Data are represented as the frequency of VV-specific B cells as a percentage of the total IgG+ memory B cells in PBMC. Line is an exponential decay curve fit, r2 = 0.68, with a starting level of ∼1.5% VV-specific memory B cells (4 wk postvaccination). The initial half-life is ∼1.0 years, with a plateau at 0.1% of IgG+ memory B cells. • Vaccinated; ○, nonvaccinated. c, Vaccinees were divided into three group (<1, 20–40, and 40–60 years postvaccination) and mean VV-specific memory B cell levels were compared. Error bars represent 95% confidence interval. There is a statistically significant difference between <1year vs 20–40 years (p < 0.001, two-tailed, one-way ANOVA) and <1 year vs 40–60 years (p < 0.001). No statistically significant difference was observed between 20 and 40 years vs 40 and 60 years (p ≫ 0.05). To better characterize human B cell responses after vaccination or infection, we developed an ELISPOT-based assay to quantitate Ag-specific memory B cells in human blood (S. Crotty, R. Aubert, J. Glidewell, and R. Ahmed, manuscript in preparation). Using this assay, Ag-specific memory B cells were detected in the blood of smallpox vaccine (VV, Dryvax) recipients, but not Ag-naive individuals, and no signal was observed with an irrelevant Ag (HeLa cell lysate) (Fig. 1⇑a). We then used this assay to measure the levels of B cell memory in a group of recently VV-immunized individuals. A group of five individuals sampled at 4 wk postvaccination were tested for VV-specific B cell memory, and ∼1.5% of circulating IgG+ memory B cells were VV specific at this time point (Fig. 1⇑b). This represents quite a large virus-specific response. Five unvaccinated individuals (VV naive) were negative for VV-specific memory B cells by this assay (<0.002% of IgG+ B cells, Fig. 2⇓a). Anti-smallpox Abs. a, Long-term production of anti-smallpox Abs. Anti-VV IgG serum Abs were measured by direct ELISA. Groups are shown in years postimmunization (<1, 1–10, 20–40, and 40–60 years). Bar indicates geometric mean. b, Correlation of serum Ab levels with memory B cell frequency. Anti-VV serum Ab titer (ELISA) plotted against VV-specific memory B cell frequency. Linear regression is shown (r2 = 0.48; non-zero slope test = p < 0.0001). c, Neutralizing Abs. VV-neutralizing Abs in serum were quantified by a PRNT50. Groups are shown in years postimmunization (<1, 1–10, 20–40, and 40–60 years). Nonimmunized individuals (naive) are shown as negative controls. Bar indicates mean. d, Correlation of neutralizing Abs with serum IgG Ab levels. Linear regression is shown (r2 = 0.39; non-zero slope test = p < 0.0003). VV-specific memory B cells were then measured in a group of vaccinees (n = 30) representing a wide range of time points postvaccination, spanning time points from 3 mo to 60 years after immunization against smallpox. VV-specific memory B cells were detected in most vaccinees, even up to 60 years postimmunization (Fig. 1⇑b). Analysis of the complete data set revealed that memory B cells initially exhibited exponential decay curve kinetics, with a half-life of <1.0 years. But VV-specific memory B cell numbers then reached a plateau ∼10-fold lower than peak and were stably maintained for >50 years after vaccination at a mean frequency of ∼0.1% of total circulating IgG+ memory B cells (r2 = 0.68; Fig. 1⇑b). Statistical testing of short-term (<1 year postimmunization) vs long-term (20–40 and 40–60 years) VV memory B cell responses indicates that there is a significant difference (p < 0.001) in the frequency of memory B cells between early and late time points (Fig. 1⇑c), but that there is no evident change in VV memory B cell frequency between 20 and 60 years postimmunization (p ≫ 0.05). We checked for the presence of virus-specific Abs in the sera of vaccinees, and anti-VV Abs were detected in 35 of 38 individuals by ELISA. The pattern of serum Ab concentration over time was similar to the pattern observed for memory B cells (Fig. 2⇑a). When serum Ab titers and memory B cell frequencies were compared for each individual, a positive correlation was observed (r2 = 0.48; Fig. 2⇑b), similar to recently published observations made for other Ags using related techniques (6). The positive correlation was moderate, indicating that multiple factors may play a role in the relationship between circulating memory B cell levels and circulating Ab levels. We tested for smallpox-neutralizing Abs using standard VV PRNT (PRNT50) to corroborate the ELISA results and determine whether neutralizing anti-VV Abs are also stably maintained. Smallpox vaccine-specific neutralizing Abs were detected in all serum samples from early time points postimmunization (15 of 15) and in most vaccinees between 2 and 59 years postvaccination (14 of 18; Fig. 2⇑c). Using a more sensitive PRNT50 assay (see Materials and Methods), low titers of anti-VV-neutralizing Abs were detected in two of the four vaccinees who were negative for neutralizing Abs by the standard assay (data not shown). These results are consistent with a previous report that anti-VV-neutralizing Ab levels are low and stable in vaccinees for up to 30 years postvaccination (14). In addition, we observed a positive correlation (r2 = 0.39, p < 0.0003) between neutralizing Ab titer and anti-VV IgG titer by ELISA. We have shown that VV-specific memory B cells are maintained for >50 years in vaccinees. However, are these cells functional in vivo? To address this issue, we looked at the primary readout of memory B cell reactivation: rapid Ab production upon rechallenge in vivo. A cohort of individuals receiving secondary smallpox vaccinations (after receiving primary immunizations 22–48 years previously) were tested for anamnestic Ab responses. Serum samples were obtained before and after immunization and anti-VV Abs were quantified. Twenty-fold (range, 4.5–40×) increases in anti-VV Ab titers after secondary immunization were seen by ELISA (data not shown). To explore this issue in greater detail, we were interested in tracking Ab responses to an individual VV protein, and we identified H3L as a good candidate protein. H3L is a VV integral membrane protein that has been identified as a target of human Ab responses and is likely to be involved in virus adsorption to cell surfaces (15). Serum samples from our study were therefore tested for Abs specific for H3L. Previously immunized human subjects had detectable H3L responses (7 of 8) before booster immunization, as expected (Fig. 3⇓a). Importantly, a strong anamnestic anti-H3L response was detected at 4 wk postbooster immunization, whereas anti-H3L Abs were virtually undetectable in newly vaccinated individuals (Fig. 3⇓a). 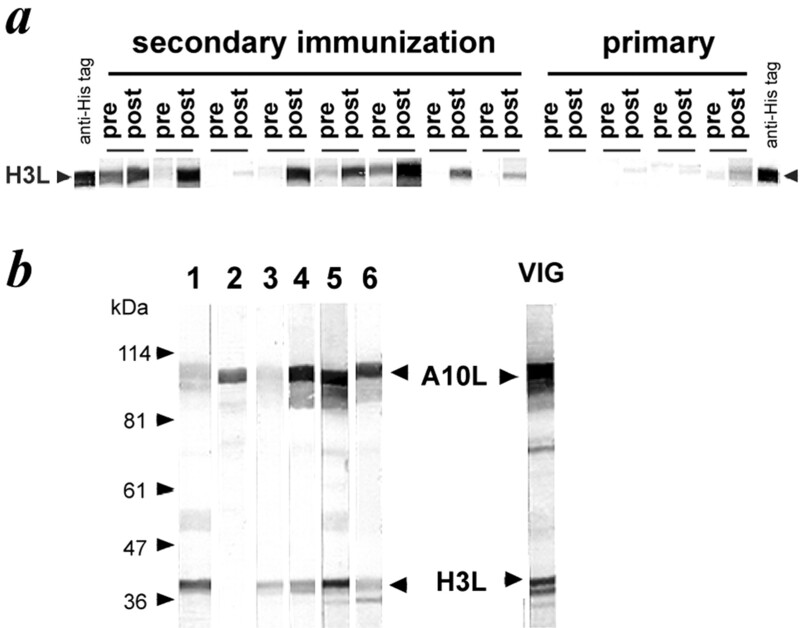 Interestingly, when whole vaccinia virions were disrupted and probed by immunoblot with sera from these vaccinees, H3L was the immunodominant vaccinia surface Ag detected (Fig. 3⇓b). (Note that also we tested VIG, the licensed Ab treatment for smallpox infection and progressive vaccinia, and VIG also exhibited strong reactivity against H3L, confirming that H3L is an immunodominant vaccinia surface Ag, Fig. 3⇓b.) In summary, these anamnestic Ab results after Ag re-exposure (booster immunization) demonstrate the potency and value of maintaining quiescent memory B cells for decades after an Ag encounter. Anamnestic Ab responses. a, Sera from 12 human donors before vaccination (pre) and 4 wk after vaccination (post) were used to probe an immunoblot of H3L expressed in vitro. The position of H3L protein (arrows) was determined using an anti-HIS tag Ab. Donors were segregated into those who had been vaccinated before in childhood (secondary immunization, n = 8) and those who had not (primary, n = 4). Secondary immunization donors had received their primary vaccination 22–48 years previously. b, Purified vaccinia virions were subjected to SDS-PAGE and immunoblots probed with sera from human vaccinees (left) or VIG (Cangene) (right). Several minor Ags and two major Ags are detected; the latter are predicted to be A10L and H3L as shown. Of all of the vaccinia genes, only the product of the A10L gene (P4b protein) has both the correct predicted molecular mass (∼100 kDa) and is present in the virus particle. P4b is a major component of the viral core (24 ). It is important to consider the role of CD4+ T cells in protection, and in particular their role in supporting an anamnestic Ab response, as a memory B cell recall response may depend on Ag-specific memory CD4+ T cells for rapid reactivation and differentiation into Ab-secreting cells (ASC). VV-specific T cells in unfractionated PBMC were detected by IFN-γ ELISPOT in most vaccinees in this study (23 of 25, Fig. 4⇓a), consistent with previous reports (13, 16, 17). Best-fit linear regression analysis predicts a slowly declining VV-specific memory T cell population with a half-life of ∼14 years (r2 = 0.57, p < 0.0002). In addition, by cell fractionation, VV-specific CD4+ T cells were observed in vaccinees up to 54 years postimmunization (Fig. 4⇓b), indicating that VV-specific CD4+ T cells are present and available to support anamnestic B cell responses decades after immunization. Smallpox vaccine-specific T cell memory. a) VV-specific T cell responses in individuals between 3 mo and 59 years postvaccination were measured by IFN-γ ELISPOT. Levels in nonimmunized individuals were <3 spot-forming units per million PBMC. •, Vaccinee; ○, nonimmunized. Linear regression shown is the best fit of the full vaccinee data set and predicts a half-life of 14 years (r2 = 0.57). The decline is statistically significant, p < 0.0002). Five individuals tested at 4 wk postimmunization had responses ranging from 44 to 644 VV-specific IFN-γ+ T cells per 106 PBMC (data not shown). b, VV-specific memory CD4+ T cells. VV-specific CD4+ T cells were measured by IFN-γ ELISPOT using CD8+ cell-depleted PBMC. Three vaccinees at different time points postimmunization and one unvaccinated (naive) individual were tested. Error bars are SEM. Vaccines are one of the most cost-effective medical treatments in modern civilization (18). The smallpox vaccine has been particularly effective, leading to the eradication of smallpox (variola virus) disease (8). Immune memory to smallpox is therefore a useful benchmark both for understanding the functional attributes of good vaccines and for understanding the longevity and stability of immune memory in the absence of restimulation. In this study, we have shown that VV-specific memory B cells are maintained for >50 years. Circulating Ab levels are also maintained for >50 years and correlated positively with memory B cell levels. In summary, these data demonstrate that immunological memory is long-lived in the B cell compartment after a robust initial Ag exposure. The biphasic kinetics of the memory B cell response, with an initial decline followed by decades of apparent stability was unexpected. The two phases observed may be due to 1) migration of memory cells out of circulation over several years (perhaps due to a differentiation program designed to keep cells in circulation in the near term, to be most available for protection against diseases that are endemic or cause frequent epidemics); 2) cellular competition (or programmed cell death) making space for new memory B cells; or 3) short-term (1–5 years) retention of Ag by follicular dendritic cells (19) before exhaustion of the Ag depot and subsequent decline in memory B cell numbers to Ag-independent homeostatic levels. The rapidity of the initial decline is unclear from this study due to limited sample size and therefore further investigation is required both to resolve the detailed kinetics of this process and exploration of the mechanisms underlying these kinetics. The moderate positive correlation observed between anti-VV-neutralizing Ab titers and total anti-VV Ab titers (ELISA) may reflect varied human Ab responses against immunodominant VV proteins, of which some presumably are neutralization determinants and others not. This dichotomy may be reflected in the varied levels of responses to A10L and H3L seen in different individuals (Fig. 3⇑b). Since Abs can be protective against smallpox (8, 20), memory B cells are likely to be important players in human immunity to smallpox, both by their ability to rapidly respond to infection with an anamnestic Ab response and by their potential ability to replenish long-lived plasma cells to maintain long-term Ab levels. VV-specific memory T cells are also likely to be critical components of the vaccine-mediated protection against smallpox virus (8), and the smallpox vaccine is known to elicit T cell responses (13, 16, 17, 21). Our data show that Ag-specific B and T cell memory are both present for multiple decades after vaccination and that these lymphocyte populations are independently regulated, since they exhibit distinct decay kinetics. The value of memory B and T cells in vaccine-mediated protection is particularly appealing in the context of smallpox because of the relatively long incubation period of variola (12–14 days), providing a window of opportunity for memory T and B cells to expand, differentiate, and quell the infection before the onset of clinical disease. This is consistent with the known efficacy of postexposure vaccination in the worldwide smallpox eradication campaign (8). In addition, the longevity of immune memory to smallpox seen in this study is consistent with epidemiologic work suggesting that immunity to smallpox disease and death is still present decades after vaccination (8, 22, 23). These data also have general implications for the longevity of immunity elicited by vaccines and vaccine vectors and may be of particular interest for vaccine strategies employing orthopox-based vectors related to vaccinia such as modified vaccinia ankara and canarypox. After this manuscript was submitted for publication, Hammarlund et al. (25) reported long-term T cell responses and serum Ab results after smallpox vaccinaiton that are consistent with the data reported in this study. We thank Lena Blinder, Siddique Hirst, and the Yerkes Pathology Laboratory for technical assistance. We thank John Wherry, Rachael Aubert, and Laurie Harrington for materials and expertise. We thank Cangene Corporation for providing VIG. ↵1 This work was supported by extramural National Institutes of Health funding. S.C. is a Cancer Research Institute Postdoctoral Fellow. ↵2 Current address: La Jolla Institute of Allergy and Immunology, San Diego, CA 92121. ↵3 Current address: Center for Virus Research, University of California, Irvine. CA 92697. ↵5 Abbreviations used in this paper: VIG, vaccinia immune globulin; PRNT, plaque reduction neutralization test; PRNT50, 50% plaque reduction; VV, vaccinia virus; ASC, Ab-secreting cell; MOI, multiplicity of infection. Crotty, S., and R. Ahmed. 2003. Immunological memory. In Topley and Wilson’s Microbiology and Microbial Infections, Immunology Volume. S. H. E. Kaufmann and M. Steward, eds. Arnold, London. In press. Plotkin, S. A., W. A. Orenstein. 1999. Vaccines W. B. Saunders Co., Philadelphia. Crotty, S., E. N. Kersh, J. Cannons, P. L. Schwartzberg, R. Ahmed. 2003. SAP is required for generating long-term humoral immunity. Nature 421:282. Maruyama, M., K. P. Lam, K. Rajewsky. 2000. Memory B-cell persistence is independent of persisting immunizing antigen. Nature 407:636. Fenner, F., D. A. Henderson, I. Arita, Z. Jezek, I. D. Ladnyi. 1988. Smallpox and Its Eradication World Health Organization, Geneva. Fauci, A. S.. 2002. Smallpox vaccination policy–the need for dialogue. N. Engl. J. Med. 346:1319. Harrington, L. E., R. Most Rv, J. L. Whitton, R. Ahmed. 2002. Recombinant vaccinia virus-induced T-cell immunity: quantitation of the response to the virus vector and the foreign epitope. J. Virol. 76:3329. Tsung, K., J. H. Yim, W. Marti, R. M. Buller, J. A. Norton. 1996. Gene expression and cytopathic effect of vaccinia virus inactivated by psoralen and long-wave UV light. J. Virol. 70:165. Hartmann, G., R. D. Weeratna, Z. K. Ballas, P. Payette, S. Blackwell, I. Suparto, W. L. Rasmussen, M. Waldschmidt, D. Sajuthi, R. H. Purcell, et al 2000. Delineation of a CpG phosphorothioate oligodeoxynucleotide for activating primate immune responses in vitro and in vivo. J. Immunol. 164:1617. Frey, S. E., F. K. Newman, J. Cruz, W. B. Shelton, J. M. Tennant, T. Polach, A. L. Rothman, J. S. Kennedy, M. Wolff, R. B. Belshe, F. A. Ennis. 2002. Dose-related effects of smallpox vaccine. N. Engl. J. Med. 346:1275.
el-Ad, B., Y. Roth, A. Winder, Z. Tochner, T. Lublin-Tennenbaum, E. Katz, T. Schwartz. 1990. The persistence of neutralizing antibodies after revaccination against smallpox. J. Infect. Dis. 161:446. Lin, C. L., C. S. Chung, H. G. Heine, W. Chang. 2000. Vaccinia virus envelope H3L protein binds to cell surface heparan sulfate and is important for intracellular mature virion morphogenesis and virus infection in vitro and in vivo. J. Virol. 74:3353. Demkowicz, W. E., Jr, R. A. Littaua, J. Wang, F. A. Ennis. 1996. Human cytotoxic T-cell memory: long-lived responses to vaccinia virus. J. Virol. 70:2627. Frelinger, J. A., M. L. Garba. 2002. Responses to smallpox vaccine. N. Engl. J. Med. 347:689. Rappuoli, R., H. I. Miller, S. Falkow. 2002. Medicine: the intangible value of vaccination. Science 297:937. Mandel, T. E., R. P. Phipps, A. Abbot, J. G. Tew. 1980. The follicular dendritic cell: long term antigen retention during immunity. Immunol. Rev. 53:29. Kempe, C. H., C. Bowles, G. Meiklejohn, T. O. Berge, L. St. Vincent, B. V. Sundara Babu, S. Govindarajan, N. R. Ratnakannan, A. W. Downie, V. R. Murthy. 1961. The use of vaccinia hyperimmune γ-globulin in the prophylaxis of smallpox. Bull. W. H. O. 25:41. Ennis, F. A., J. Cruz, W. E. Demkowicz, Jr, A. L. Rothman, D. J. McClain. 2002. Primary induction of human CD8+ cytotoxic T lymphocytes and interferon-γ-producing T cells after smallpox vaccination. J. Infect. Dis. 185:1657. Mack, T. M.. 1972. Smallpox in Europe, 1950–1971. J. Infect. Dis. 125:161. Arita, I.. 2002. Duration of immunity after smallpox vaccination: a study on vaccination policy against smallpox bioterrorism in Japan. Jpn. J. Infect. Dis. 55:112. Pedersen, K., E. J. Snijder, S. Schleich, N. Roos, G. Griffiths, J. K. Locker. 2000. Characterization of vaccinia virus intracellular cores: implications for viral uncoating and core structure. J. Virol. 74:3525. Hammarlund, E., M. W. Lewis, S. G. Hansen, L. I. Strelow, J. A. Nelson, G. J. Sexton, J. M. Hanifin, M. K. Slifka. 2003. Duration of antiviral immunity after smallpox vaccination. Nat. Med. 9:1131.